View of the South Courts Central Axis and the Gate of Great Accomplishment, the Dacheng Gate (Photo November 2007). Map of DongCheng District with Location of Dongsi Mosque. Click Map to go to Full Version. the location of the Holy Kitchen, the Pavilion for Sacrificial Animals and the Well Pavilion. To the West lies the Gate of Reverance, through which one can pass to the Imperial College (GuoZhi Jian), and stands the Hall of Vegetarian Diet. 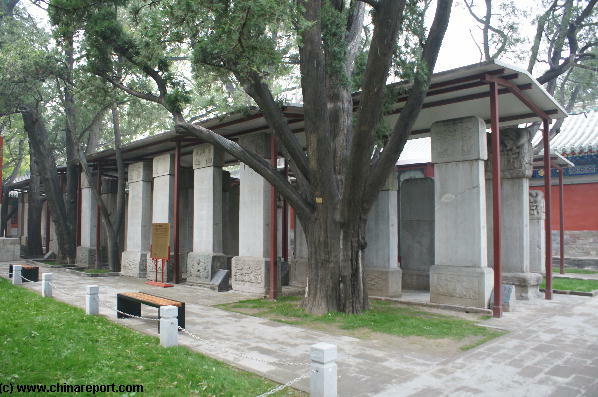 Throughout the courtyard there are the pavilions with steles for the records of Jin Shi. 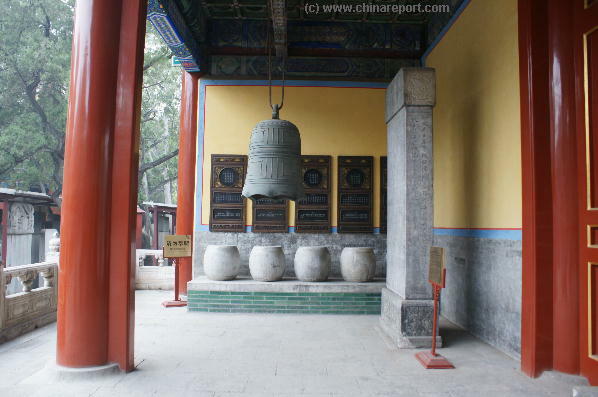 Inside the South Courtyard one can dwell among between the multitude of Stone Steles declaring he names of the Proud Jin Shi, those who received this Title through enduring through and passing the highest level exams in the Confucian State Doctrine of the Empires administration. The construction of the Temple of Confucius was initiated in 1302 AD and completed in 1306 AD during the Dade Reign of the Yuan Dynasty. After the demise of this Mongolian Dynasty, in both the Ming and Qing dynasties the Temple was enlarged with additions. Today's Temple Structures cover a total area of 22,000 square meters (5.4 acres) making it the second largest Confucian Temple in China ranking only behind the Temple of Confucius in the village of birth of the Great Master, ZhongNi, in Qufu County in Shandong Province. 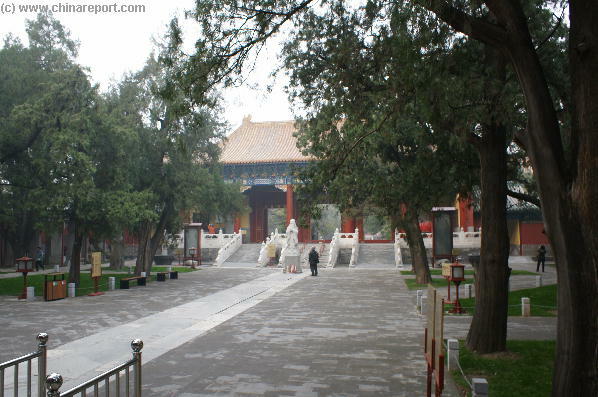 Once inside the Gate one is suddenly secluded from the rumor and noise of Beijing's Inner City and one enters into a large Courtyard which abounds in gracious and large Cedar Trees. and it takes some effort the identify which belongs to which dynasty. Naturally they are inscribed in ancient Chinese Caracters, making them hard to decipher for those who have not mastered the Chinese language to this Level. To be precise, three Steles Date to the Yuan Dynasty. 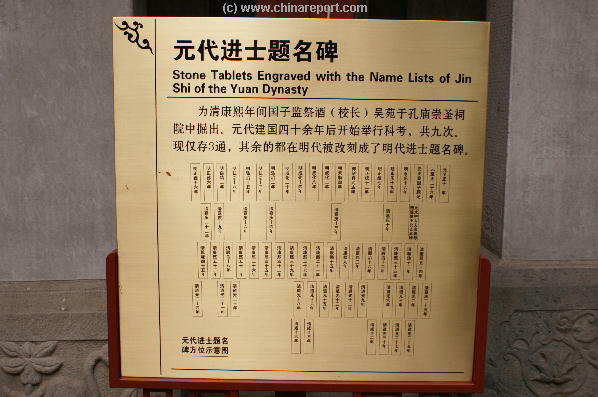 A Further 77 Date to the Ming Dynasty and from the Qing Dynasty Era there are another 118 Stone Steles with names of Jin Shi. Today the Steles form a precious collection which is a rich source for studying the Ke Hu, or the Civil Service Examination System. 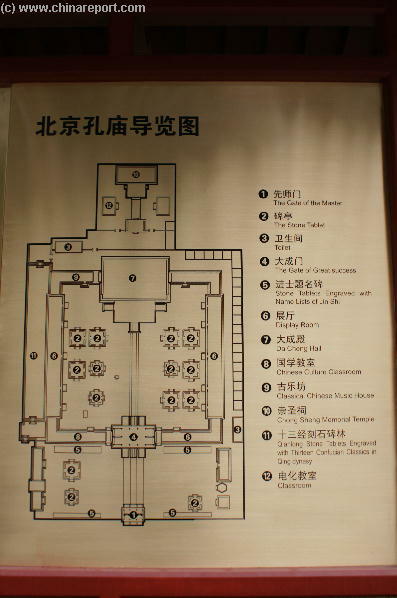 An Overview Map of the Entire Confucius Temple Complex with Link-throughs to each section covered by ChinaReport.com. (Photos November 2007 AD). 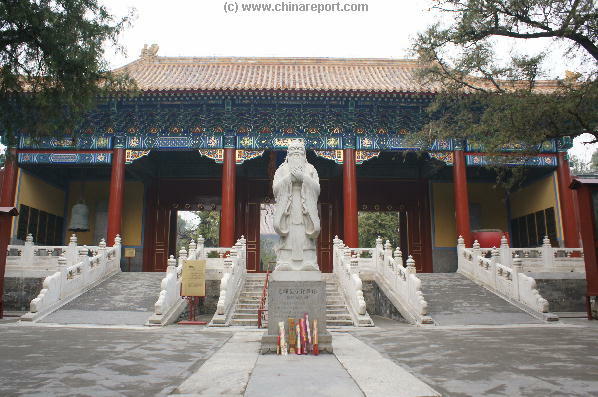 View of the DaCheng Gate, the Gate of Great Accomplishment (Success) and the Statue of Confucius. (Photos November 2007 AD). The subjects emphasized, naturally, varied from Dynasty to Dynasty. View Westward of the Gate of Reverance, leading to the South Court of the Imperial College (Gao Ji Dian). Rows of original Steles with inscribed names of Jin Shi within the South Court of Confucius Temple. (Photos November 2007 AD). Immortal K'Ung-Fu Tzi, Confucius. Secondly, there was the Yearly Speech of the Emperor for the Imperial Academy situated right next door as well as irregular meetings with the Professors of the Academy who also provided important advice to The Throne. Thirdly, and most central to the function of the Academy, there were the exams themselves. From the start in the Year 1306 AD, on average the exams were held every three years inside this very complex. The 3 year period allowed for county level and provincial level examinations to be held in between, selecting the candidates for the final and highest exam at the National Level. After the full rounds were completed, the best were invited to join the Grand National Exam in the Emperors Capital of Beijing, an incredibly high honor for both candidate and his family. 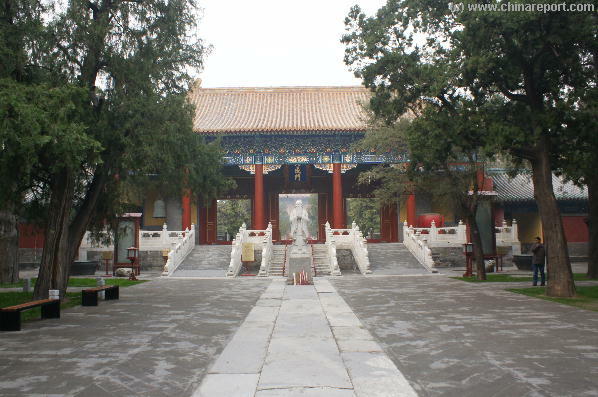 The exams were held each 3 years in the Confucius Temple, that is until much later during the 18Th Century Qianlong Reign of the Qing Dynasty, when the Exams were moved to the Imperial Palace's Outer Court, where the BaoHeDian Hall of Preserving Harmony and became the new venue for the Exams known as the Palace of Examinations. 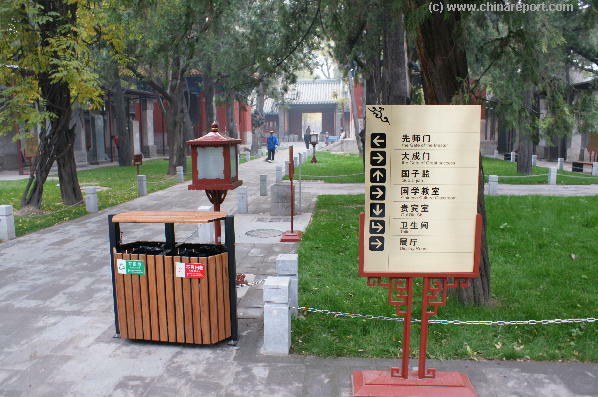 The Confucius Temple is originally designed as an architectural combination with what is today known as the adjacent Imperial College grounds. 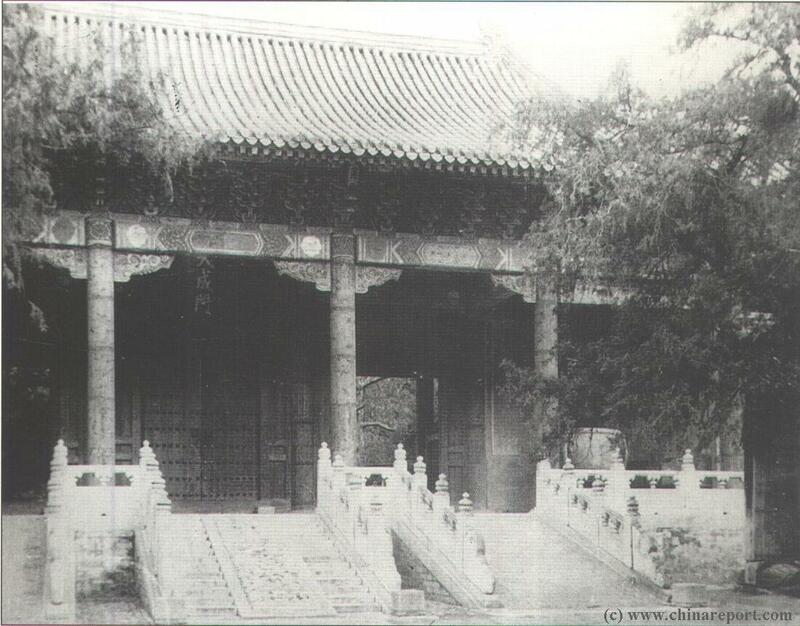 The complex thus created was both the Nations High Academy as well the Highest Confucian Temple in the Empire. Within the dual complex the Imperial College was situated in the Western Parts and the Temple of Confucius in the Eastern Parts. The Institute housed within this dual structure was of such fundamental importance to the State Machinery that it was one of the places outside the restricted Palace most frequently visited by the Emperor himself. Schematic overview of the first group of Steles dating to the Yuan Dynasty and the first years of the Ming Dynasty. (Photo November 2007 AD). Fu Confucius and his Ancestors. Any visitor can with due respect, pay his or her own Tribute and have a moment of Silence and perhaps awe at the Master and the achievements made by Chinese Civilization with the philosophical teachings of him and his later followers. Offerings of Incense Left at the freshly restored Gate and clean Statue of the Great Master. (Photo November 2007 AD). throughout China as the First Master (and Teacher) of Chinese Philosophy. K'Ung-Fu Tzi a.k.a. Confucius was a Chinese Scholar born around the year 551 BC in ZhongNi Village which , during the Life of Confucius, was a small place in the State of Lu. Today the village is part of QuFu County, in Shandong Province. The personal name of K'Ung-Fu Tzi was Qiu and his courtesy name was Zhongni. K'Ung-Fu Tzi, or Confucius, died in 479 BC. 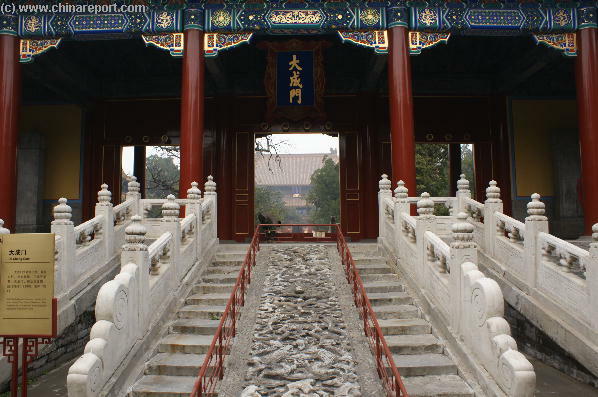 Above: White Marble Steps of Da Cheng Gate. Right: Details of the interior of freshly restored Gate of Great Accomplishemnt with stone drums, a stele and a Bronze Temple Bell. (Photo November 2007 AD). During his Youthly years Confucius was a low-level ranking official in Lu, tending to sheep and oxen. Later however, Confucius was mainly self-employed as a private teacher. It is said that Confucius had more than 3000 students, of whom some 70 are considered to have been the most excellent. As he traveled around the various states of the realm, the master was often accompanied by one or more of these students. Read More on the Philosophy of Confucius and Followers as well as the Capital Museum Exhibitions on the Next Page(s) ! 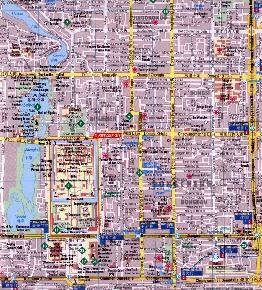 Browse through the Report Pages on Confucius Temple using this Map. In total there were 198 Stone Tablets or Steles within this outer courtyard, which at the End of the Qing Dynasties' days counted no less than 51 thousand 624 names of Jin Shi. The dates and names starting with the later days of the Yuan Dynasty (1271 AD - 1368 AD) and leading through the Ming Dynasty (1368 AD - 1644 AD) to the year 1905 AD near the end of the Qing Dynasty (1644 AD - 1911 AD). There is plenty of space to dwell around here. The Cederas inside the courtyard are the ancient guardians of the Temple, having been here for centuries offering a cooling shade as wel as adding to the solemn athmosphere of the court and architecture. Inside the Gate are 10 stone drums and two stone steles dating from the years 1736 AD through 1795 AD of the Qing Dynasty. offered the High Position he sought after. Confucius' teachings therefor remained a mere theory. Only when he was in his fifties did Confucius gain a post of Official in the State of Lu, a time during which he was in charge of the punishment of criminals and the maintenance of social order in the Lu State. Surprisingly however, Confucius held this position for only three months, after this brief last stint he once more threw his energy into Literary Works and Philosophy. In this later period in his life the Master compiled and translated a number of Literary works. Historic Photo of the Gate in the 1920's. Although the teachings of Confucius (and Mencius) were accepted as State Religion as early as in the founding years of the Han Dynasty (206 BC - 221 AD), the Institute of the Imperial Service Exams was founded centuries later in the years of the Sui Dynasty (581 AD – 618 AD) and the Tang Dynasty (618 AD - 907 AD), which developed the laws of the Nation further from where the successful Sui had left off. The System remained the gateway into the Imperial Administration for over 1200 years until the year 1905 AD when the Qing Dynasty (1644 AD - 1911 AD) Court was forced into modernizations by the reality of 7 Allied Nations infringing on its Sovereignty. In the end, altogether the Imperial Examinations were abolished in 1906 AD, after an order to do was given by the Imperial Government on September the 2nd of 1905 AD. It was the end of an Era, although in essence the system had been planned to be modernized, then reinstalled in a new and more modern form. five branches of government, although this was quickly suspended due to the turmoil in China between the two world wars, such as the warlord period and the Japanese invasion. In turn, the Kuomintang administration revived the Examination Yuan in 1947 after the defeat of Japan. This system continues into present times in Taiwan (R.O.C.) along with the regime itself after loss of the mainland to the Communist Party of China. During this long time the examinations were frequently held, in general every 3 years. Admitted to the Exams at Confucius Temple were only those remaining after the Provincial (Prefecturate) Level Exams.